Here’s tips on how to get stories straight. Our lives are ruled by stories… the ones we are told, from cradle to grave… the ones we ignore and especially the ones we believe. Yet many of these stories that direct our lives might be slanted, created for the agenda of others or simply not true. There are a lot of people who feed us false stories. How can we tell which are true? The USA Today article “This 21-year-old tweeted lies about Robert Mueller and Ruth Bader Ginsburg” (1) shows how our beliefs are regularly swayed. The article says: A false claim bubbled up from the internet last month that Sen. Kamala Harris, the recently announced presidential candidate, wasn’t eligible for election because she had immigrant parents and spent part of her childhood in Canada. The claim, an echo of the “birther” conspiracy that trailed President Barack Obama, was widely debunked but still addressed seriously by mainstream news pundits, including CNN’s Chris Cuomo. On Twitter, where he has 186,000 followers and is adept at quickly responding to Trump’s tweets to gain many more eyeballs, Wohl has claimed, without evidence, that Supreme Court Justice Ruth Bader Ginsberg is secretly dead or in a vegetative state and that pipe bombs sent to prominent Democrats and media outlets were a left-wing “false flag” operation. Wohl’s most prominent gambit was also his most disastrous: an apparent sloppy attempt to accuse Trump’s nemesis special counsel Robert Mueller of sexual misconduct days before the midterm elections in November. His actions were referred to the FBI for potential criminal investigation. Deciphering the Mueller saga is characteristic of how difficult it is to grasp at the truth with Wohl, who represents a political moment in which even the most basic facts are in dispute. Both sides of our political system are using tactics like this to distort our beliefs. This is nothing new! There is an American tradition of deceit in politics. 150 years ago 19th-century political operatives paid newspapers to dictate coverage. For example there were false accounts about President Andrew Johnson being a murderer. In the 1860 presidential election the issue of slavery was a key, but the Republican’s had a moderate core on that issue and focused more on a protective tariff, a transcontinental railroad, and a Homestead Act that promised to give free land to settlers using the campaign slogan “Vote Yourself a Farm”. Lincoln also won important states by offering cabinet posts to those states. The slavery issue may have won Lincoln the election only because is the Democratic Party so badly shattered that there was no hope for unity. Each party sent hundreds of activists out to campaign before the 1860 election. The Democrats aroused Northern crowds with warnings of secession should Lincoln be elected. The Republicans, sent thousands of young men turned out in “Wide Awake” torchlight parades. Back then, the Democrats and the Republicans told very conflicting stories! The Democrats made fun of Lincoln’s limited experience his “slang-whanging stump speaker” style, which they said reflected a limited intellect that would be an embarrassment to the nation should he be elected President. According to Michael Burlingame, Professor Emeritus of History at Connecticut College (2): The election of 1864, in the middle of a civil war, was even more vicious. The Democrats used the press to attack Lincoln. In its September 24, 1864, issue, Harper’s magazine listed all the abusive terms that had been applied to Lincoln in the previous months: Filthy Story-Teller, Despot, Liar, Thief, Braggart, Buffoon, Usurper, Fiend, and Butcher. We all know how well the elections of 1860 and 1864 turned out. Yet people don’t get it. There has always been slanted news in US politics… and commerce. Here we are almost 160 years down the road and the root nature of political activity seems to have hardly changed at all. The difference now is that the internet has democratized that deceit. It’s easier to send a tweet than print a newspaper. It’s difficult to determine the source of online claims. The act of fact checking actually helps propagate fake news. This puts far more players in the field and rewards those who are most outrageous. Being repeatedly bombarded with a claim – social media’s specialty –increases its perceived accuracy, even if it’s false and has been publicly debunked. People are more likely to believe a false claim that fits their ideology, and the internet naturally facilitates people like the 21 year old tweeter finding and communicating with like-minded groups. The article explains how conservative fact manipulators frequent bohemian coffee shops as the “Temple Mount”. When they hear something that seems popular with the liberals, they flip it 180 degrees. I suspect that liberals are equally frequenting places where the conservatives hang out and equally flipping the stories they hear. Okay that’s enough of the problem. If we have a problem spotting which stories in our lives are false and which are true, there is something we can do. The manifestation we call “intelligence” is a bundle of frequencies working in a repetitive unison following “laws of nature”. Every entity is a symphony come alive. If the symphony remains in perfect unison… the music is sweet… the being created by the frequency bundles exist at maximum efficiency and operate “at ease”. If the harmony gets out of balance, there is dissonance and efficiency is lost. There is “dis-ease”. We can use more than thought to separate truth from fiction because all existence in the universe is a swirling mass of energy. Form is created by density and speed of energy and the vibration of atoms and molecules, along with the impact of environmental forces (everything else). All matter is vibrating energy as are all emotions and thoughts. Thus all thought, reason, emotion, will or desire are accompanied by vibratory rates, which may be lowered or raised by external forces… such as the planets. In the same way that the vibration of a musical note can affect the atoms and molecules in a mirror and cause it to shatter, so it is with planetary resonance. 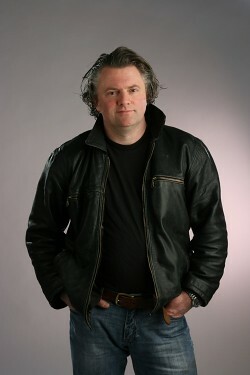 According to Dr. Percy Seymour, a Theoretical Astrophysicist, resonance makes it possible for a radio telescope to tune into specific vibrations in the Andromeda Galaxy (14 million, million, million miles away) and accounts for the Solar System playing a symphony of vibrations on the magnetic field of the Earth. If so, then even small fluctuating forces can have large consequences. There is a resonance from the tugs of the tide. There is a resonance from the hot gases trapped in the magnetic field of the Sun and Earth. There is resonance in the fluctuations of the Earth’s magnetic field. There is resonance in the reflected sunlight from the moon that waxes and wanes. All these frequencies have an impact on the electrical activity of the neural network in the brain. Resonance of frequency (harmonics) is the celestial link to the terrestrial form. The study of the harmonics of cosmic periods or resonant theory (harmonics) can help us dramatically boost access to the wisdom we possess but do not know how to reach. The study of resonance explains why we attract certain events, or people, to us who reflect the state of our consciousness. Thus, when we are angry we are more likely to attract the violence or car accident which we are resonating with. More positively, it is the explanation for miraculous events in that we ‘entrain’ ourselves to good unfolding when our thoughts are constantly kept at the higher vibration, or frequency, of love and happy outcomes. How to Tap Into What’s Good and Bad For You. Our thoughts have a resonance. At a deep level when we think about a story it makes us either weaker or stronger. We can use a yes no approach to testing stories we read or hear. There are numerous ways to test weakness or strength. 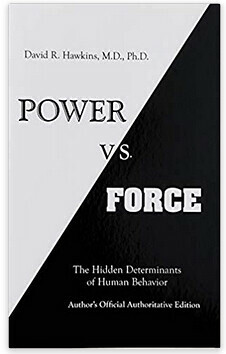 This powerful method of determining truth is explained in the book “Power vs. Force” (3) by David Hawkins, M.D., Ph.D. The book makes the huge promise that it will give a totally effective way to determine if we are being misled. The book explains how the universe is full of high and low energy patterns. True stories have high energy that make your body stronger. False stories make you weaker. Hawkins uses muscle testing to see if yes a story makes someone stronger, “yes”… or weaker “no”. Normally we have to learn what’s true and what’s not through trial and error. The technique Hawkins outlines in his book shows how to see and understand the difference between high and low energy patterns. I personally use a pendulum. When I get a story, I look at it to get a feel. Then I get out my pendulum and ask the question… “is this story good for me”. 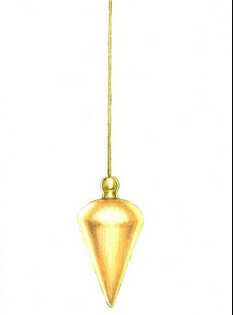 If the pendulum swings clockwise… that’s a sign of truth and strength. A counter clockwise swing? Better fact check some more… or not… just don’t believe the story. For example when I make an investing decision… I do my due diligence… knowing I’ll never have all the facts. Then I make a decision. Then I ask the pendulum… “is this decision good for me”. If I get a counter clockwise swing… I go back to research and normally don’t act. My years of practicing this method have created a lot of trust in my belief system in an era where it is truly difficult to believe anything you see or hear. You become the arrow by unleashing intuition. Our courses are aimed at unlocking the power of our intuition by integrating this deeper intelligence with our logic. We can discover and enjoy better business opportunities when we use the whole power of our mind. Be the archer and become the arrow. Broader thinking helps us hit the narrow targets in our lives. Super Thinking helps us to be smarter so we can absorb, retain and recall information. We use super thinking techniques in our Spanish courses, Writer’s Camps and investing seminars. Super Thinking allows delegates to start talking and making sentences from the first day of the course. Studies have shown that talking is the ONLY way to perfect speaking Spanish. Speaking a language like writing is not like memorizing a poem. These skills are learned in the same way as riding a bike. The process to perfection is experiential not educational. You learn by doing… not studying. 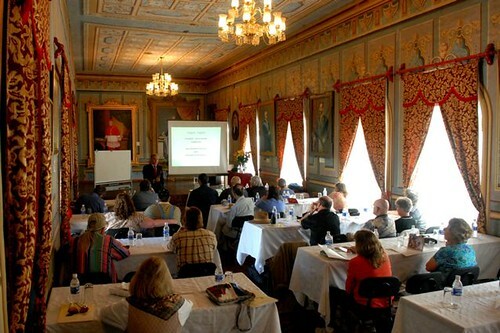 Learn about our Super Thinking + Spanish course in the Blue Ridge July 18, 19 and 20. You can do it. We have abilities far beyond what we are taught in school. We do not have to let the tyranny of reason deny us our destiny. Here is proof. When, in the state of relaxed concentration, we tap into the higher intelligence that we all possess. An example of the human ability to become an arrow is shown in an amazing video below. This video sent to me by our Spanish pronunciation coach, Don Childs, shows an archer who makes incredible shots including hitting an aspirin thrown in the air. He says the trick is to trust your intuition and become the arrow. 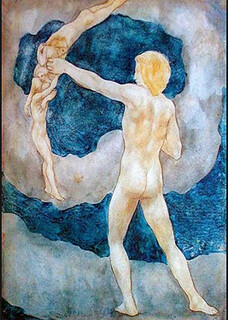 Kahil Gibran’s verse about children in his epic poem “The Prophet” shares this truth in an eloquent prose. We gain much when we reflect on our words, our businesses and lifestyles as our children. This is a great way to start a week. For even as He loves the arrow that flies, so He also loves the bow that is stable. May all your arrows be true this week and always. See an video to see how good we can be when we become the arrow. See how intuition brought Phytobiodermie natural health benefits closer to us. Anyone in the health care field especially those who do body work can create a global income with Phytobiodermie products. See how to export these top quality Swiss products to Ecuador or anywhere below. This part one in a series on how profits, fulfillment and benefits can flow in many ways when you follow your passion in business investing and life. When you attend Merri’s and my courses on integrating logic and intuition… Watch Out! You may end up following some fun, wild, zany paths. 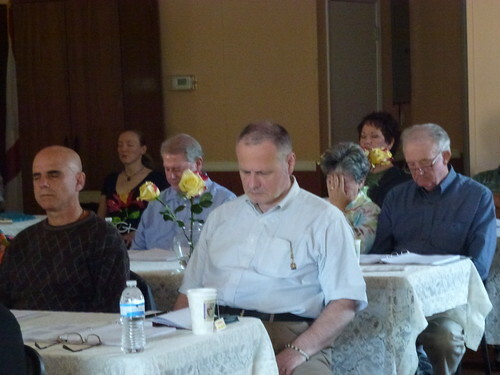 For example, one couple, who were developers attended a business intuitive seminar we sponsored. Did the course help them in their development business? Perhaps but one of them ended up riding a bike 4,000 miles across Africa to promote tourism in Africa that will help the poor there. 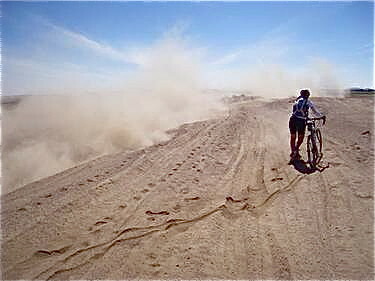 Here she is crossing the Nubian Desert! Getting your logic in touch with greater intelligence via intuition can lead you in directions and ways you’ll not expect. Merri and I often gain confidence and new directions from ahas that are more than wild imagination. Ahas and spontaneous thoughts are a form of communication that go beyond what our brain can sort out in finite terms. Seeds of belief become planted, that are then cultivated with trial, error and experience. We have made small fortunes again and again in this way. Once we bought Jyske Bank shares based on this hunch. See how we earned hundreds of thousands of dollars. We bought out hotel in Ecuador on a hunch. We bought a block of condos after exchanging a 15 second glance. But both after years of researching the Ecuador real estate market. Often we have earned hundreds of thousands of dollars (and on occasion millions) based on “illogical” hunches. For example, our Ecuador business has been booming for years. Our hotel has been fully booked again and again. We were swamped with business in Ecuador when the US economy slowed. Our Ecuador real estate rose as US real estate collapsed. Yet in the midst of this success we moved back to the USA and began buying US real estate and expanding our focus on living and investing in small town USA. Let me outline the crazy illogical reason why. First, when we were in Florida Christmas 2007, I saw Florida real estate prices that were real bargains… maybe even better than Ecuador. We were so impressed with these prices that we hired our daughter, Cheri, part time to take a look. That would not have been enough. We are early in – early out people but Ecuador’s cost of living is still so much lower… Ecuador life is so much simpler… business was so good. Then came the chain of illogical events. Susan Rotman, our business psychic consultant, sent an electronic card… all about US patriotic songs and sights. See the card here. This card is very patriotic… very not Merri and me. Susan knew it as well. “Okay what’s this about?” I emailed her. She replied: “Interesting–I woke up yesterday morning from having a dream about you and Merri. As delightful as you both are, I have never dreamed about you before! And it was from that I was moved to send you the card“. We called and asked for a consultation. During our talk, she said she dislikes Florida but saw us spending time there. That was clue #1. 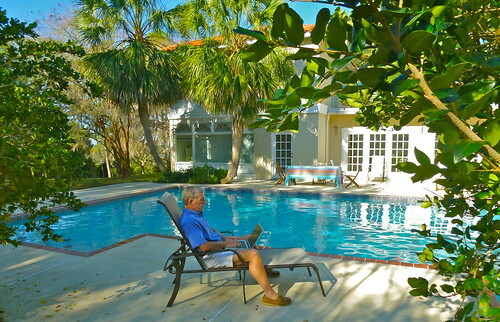 Then Jyske Global Asset Management started up its seminar business and wanted us as partner… in Florida. They chose the hotel for the first seminar… The Beach Club where Merri and I had our first seminar ever. We start there May. Clue #2. Then we met up with our astrologer, Blaine Watson, and saw in our chart that a change was in the making as well. Clue #3. Enough. Enough. We got the point and headed to Smalltown USA to look around. We were amazed at the deals and ended up buying 16 acres near Mt. Dora, Florida based on these totally illogical non linear reasons. The adventure and the outcome has been interesting to see because intelligence beyond logic often leads to lucky coincidence. 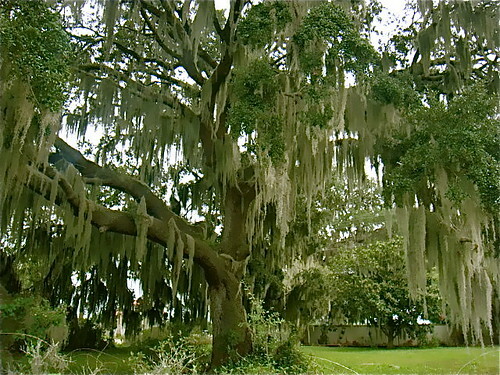 This is one of the ancient oaks at the entrance of our Florida house. Here is the orange grove on the property. Merri and I love the house as a place to live… but also picked up an orange grove as well. This turned us into farmers though you can count my knowledge in this field on your fingers… of one hand. Yet the first note in this series Bio Wash Environmental Profits tells how we removed one third of the lower producing trees in a grove management plan and then sprayed the remaining 2/3rd with Bio Wash. The year before we took over, the grove produced about 1,500 boxes of oranges. This year with 500 fewer trees, the grove produced 2,484 boxes of oranges. In other words, last year the average yield of about 1.2 boxes of naval oranges a tree. This year the average yield was 2.4 boxes a tree… double. This increased the income of the grove 37% with 33% less trees. Even after the cost of removing and replanting a third of the grove the profits were almost $1,000 an acre… all unexpected extra income. So by following our intuition we gained some extra cash. Moving to Mt. Dora brought much more. We have also gained extra natural health benefits because following our feelings as well as our thoughts has helped us gain more advantage of Phytobiodermie. Phytobiodermie is a non-surgical body and facial rejuvenation. Merri and I have enjoyed this powerful Swiss treatment for over two decades and can attest that it leaves you looking younger and feeling great. Few treatments areas effective, enjoyable and relaxing. Yet there is more than just relaxation and stress release. There can be considerable health benefits from this treatment. This revolutionary system comes from Swit zerland which is known for its purity and highest standards. The Phytobiodermie Swiss skin care and detoxifying system has over 25 years of experience. Their wonderfully enjoyable treatments combine Swiss technology, chromotherapy (color energy) and Chinese energy medicine to clear the body’s lymph system. It stimulates energetic points that promote the toning of the skin while adding a sense of well being and deep relaxation. Like acupuncture and feng shui, chromotherapy is a positive energy reb alancing. When combined with a detoxifying lymph drainage, steam and mineralized soak, you look and feel years younger. Merri and I have watched numerous Phytobiodermie demonstrations where half of a face is treated. The difference in appearance is quote remarkable. Merri and I used Phytobiodermie healing massages as often as possible for years. A friend in North Carolina was a trained tech and we had regular phytobiodermie lympth drainage massages from her. We liked these so much we bought phytobiodermie equipment and supplies and trained the masseur at our Ecuador hotel how to do a Phytobiodermie massage. we learned that Phytobiodermie moved its USA headquarters about 17 minutes from our Florida house. Now when here, we can have a massage every week. Integrated thinking creates extra potential for great wealth… satisfaction… fulfillment…happiness… joy growth… If we can stop looking and use our inner vision. This is a time of change and the old ways will no longer work. We need insight and vision to guide us because the best ways ahead have not been seen before. So the next time you need a miracle…do not deny that one can happen. The next time you have done your due diligence and some small niggling idea reaches you, act on it. This does not mean you should stop working nor that you should quit using due diligence. The idea is to fuse the intellect and intuition, not abandon nor honor one over the other. They work best as a team! Tomorrow we’ll see how we may also get a totally unexpected… unpredictable… huge real estate value jump on the land! Using your intuition and paying attention to your hunches does it mean you should go out and risk all on a hunch. Start small….all things should start small and grow. Nor does it mean you will not have to work. Often the hunches have led us to incredible amounts of labor. You possess connections to infinite knowledge. Your mind cannot grapple this because the act of defining defeats the very thing you are connected to. However, if you let go and let your intuition lead you, you too may have some wonderful surprises and luck that after awhile will not be surprising at all! 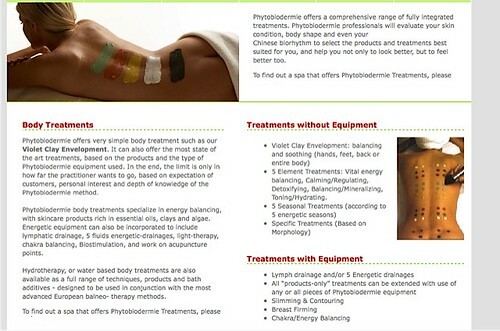 Phytobiodermie has arranged discounts for our readers and has set a special schedule so delegates at our April 9-10, 2011 course can have a massage the day before or after or in the evenings of the 9th and 10th. An international internet business using intuition has the advantage of a wider field of vision. Change, though often feared, is our friend because it opens fields of opportunity. Without change, we could never progress. Problems arise however when our thought process resists rather than embraces change. Combining our logic and intuition assures that this is less likely to happen. Our Ecuador course on Super Thinking helps delegates learn how to absorb, retain and recall more information. This helps improve our logic. Delegates at a previous Ecuador Super Thinking plus Spanish course we conducted in Cotacachi. Yet to go beyond logic we need to combine our thinking with intuition. Many Ecuador shamans and shamanas teach the Eagle & Condo Prophesy… a time will come when the eagle and condor fly in the skies together. Many believe that the eagle represents logic and the condor intuition. 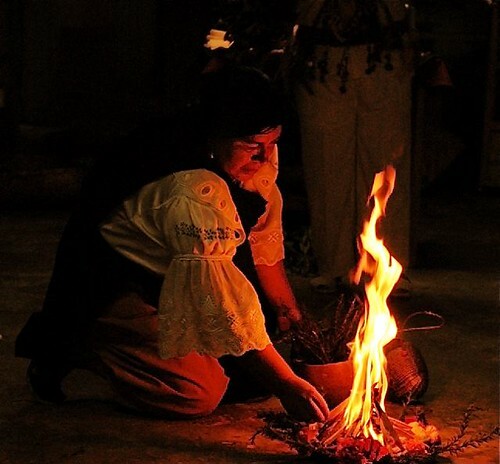 The prophesy says that sharing of indigenous knowledge with the technologies of science will help balance mankind. One way to blend intuition and thinking is through playing games. 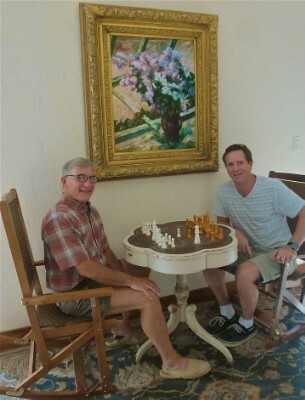 A game is a structured activity, with a set of rules. This is important… because when we game… we can create a set of rules that is beyond the norm… outside the box. Gaming is usually undertaken for enjoyment. This makes gaming important as well. When we do something fun… without risk…we do it better. We can let our imagination soar so we can see eventualities in enjoyable, non threatening ways. Games are formalized expressions of play which allow people to go beyond immediate imagination and direct physical activity and see life’s potential in different ways. When games eliminate play… they lose impact… thus the demise of professional sports which are no longer games… but business. Gaming allows us to use disambiguation in resolving future conflicts. This is because our future is often ambiguous. In other words, our life can take a number of paths that lead in different directions. Gaming allows us to create a set of out-of-the-box rules that direct us in ways we would never logically reach but can imagine. Because it is fun and without threat… we can see future opportunity in numerous expanded ways. One way we can game is to form ideas from our intuition. Then we apply the game’s set of rules that change the circumstances of the idea. There are two ways to let our intuition to kick in. One way is to let outward events kick start our intuition… such as spotting birds. Recently I mentioned how I use the heron as an intuition initiator. Other birds are meaningful to me also. Doves, for example, are a sign of “Thinning the veil”. “Crows represent “Magic & Creation.” These concepts represent archetypes that we can apply in an out-of-the box game. 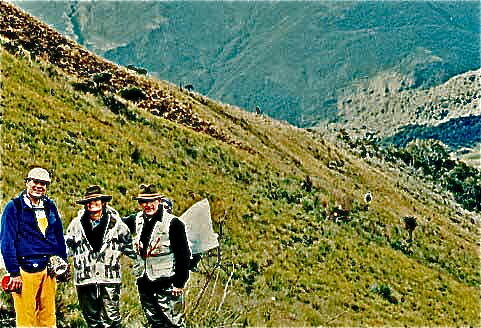 One way the Ecuador shamans taught us to trust our intuition is to hike steep trails with our eyes closed. This is the first time we received this lesson when Merri and I along with our friend, Dr. Jay Glaser, and several others hiked into the sacred Llanganatis Valley in Ecuador. Another way to connect with intuition is internally. Here is how I start the gaming process when I have a question to process but have no external suggestion or archetype to use. This is an ageless business solving technique that employs meditation, but is designed for the hard working businessman who needs to make numerous decisions at a faster and faster pace. Whenever I have a decision to make (this can work for decisions about investing as well as business), but insufficient knowledge to make it, I sit down and write for a few minutes every single thing I can think of relating to this decision or question. This is a private, personal brainstorming session, so I let any thought I have fly. This is an important part of the tactic because the process of writing integrates the neural muscular system. In short, I am locking the data about my decision into every aspect of my being. Next I relax and meditate for ten minutes. You can use whatever meditative technique you know or use. When the ten minutes of quiet is finished, I immediately write down whatever thoughts that come. These thoughts help clarify and bring to the foremost the keys to help bring forth the right decision. This decision making process focuses the entire body on the decision, and then takes us to a deeper level of intelligence. The wisdom we all possess is profound and this technique taps depths beyond our logic. I often come up with things I can never logically explain. Answers often come in code, much like dreams. If you use this tactic, you may find your thoughts are on green alligators or flying elephants. Do not discount the thought whatever it is. Write down whatever comes to you! If you reflect on this, an answer will almost certainly appear or you will get a signal. This process unlocks your intuition as well as uniting it with your intelligence. Merri and I rarely make an important decision without using these techniques and then we pray asking for our intellect to come up with the right answer that is BEST for all parties concerned. We live in a world of increasing change. How nice! This means we live in a world of increasing opportunity. We can improve our chances of opportunity if we let our imaginations unite our intuition and logic.